What’s the point of practice? Effective practice delivers results that stick. And that are be usable. In other words, you’ve got to be able to hold on to the information and skills that you learn over the long term. And you’ve got to know it deeply enough that you can apply it easily in real time as you play. I’ll get to the practical details of how to do this in just a second. It’s going to help, first, if we go over the two things that will stop this from happening. You need to have high levels of concentration throughout your practice session to help the new information stick to go deep into your long-term memory. Now, this means making sure that you’re focused at the start of practice sessions. And keeping them reasonably short so that you can maintain that focus throughout. A great answer to the question, “How long should I practice for?” is “As long as you can remain focused”. 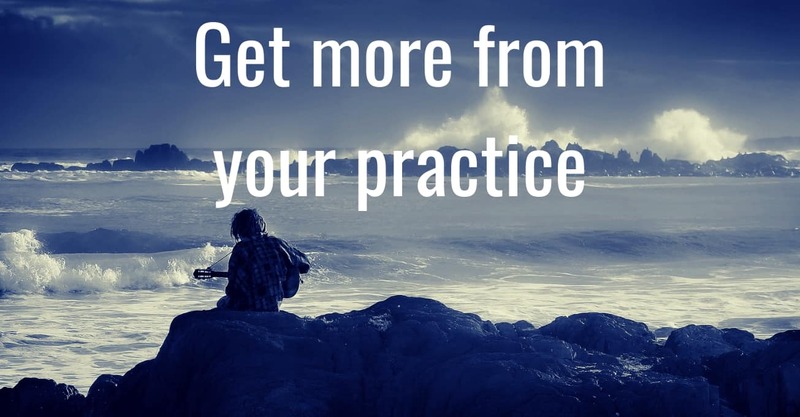 Little and often focused practice easily beats occasional bingeing. You probably move on from the topic you’re practicing too soon. Sure, you might know it theoretically. Or be able to do it to an okay level. But you don’t really own it. Not to the point where you’re able play it easily and flawlessly in a performance situation. Under all sorts of pressure. So you want to be going deep into what you practice. Pick a topic that really matters. Break it down into small, achievable steps. And then stick with that topic until you’ve made really significant progress. You want to stick with a topic over time, working on it little and often. That allows you to maintain focus in each individual practice session. But also, over time, build up the depth that you need to really know stuff. A great way to do this is to always have a small number of different topics on the go. That way, you can rotate between them, keep things fresh, not spend too long on anyone in each individual day. But you’re always making progress, and you’re sticking with those few over time and really going deep. Pick one specific area. And put those other topics that you might want to work on to one side for the moment. Know exactly what exercise you’re going to work with on your chosen topic. Know what your goal is for that exercise. Now, this takes some time to do, but the time you spend planning is going to pay off in results in the long-term. I personally like to spend a bit of time thinking about the topic as a whole first. I usually do that only once – at the point where I’ve decided this is something I’m going to focus on. That’s when I plan out what the big picture is going to look like. But then, on a daily basis, just the night before, I pick which precise exercise I’m going to work on the next day. That’s how I plan things on a day to day basis. Just before you actually start to practice, you want to set an intention for that session. This is about being present and focused during your practice. It’s also an opportunity to remind yourself of exactly what your goals and exercises are. So just take a second to calm your mind before you start. Rather than jumping straight into the practice. You might like to close your eyes, take a few deep breaths. It’s much, much easier to make sure you get focused properly before you start, than to try and build up that focus during the session itself. But no-one can maintain strong focus forever. So you’re going to want to take some short breaks. These allow you to recharge that focus again. To make sure they happen, plan these breaks in advance. An absolute minimum of one break every hour. I like to go a bit shorter – maybe one five-minute break in every half hour. That should be plenty to recharge your batteries, take your mind off things, then come back focused. It’s easy to get lost in what you’re playing in the heat of the moment. So use a timer just to make sure that you do actually respect your plan to take breaks. It’s also important to limit the time that you spend on any one topic before you switch to another one. Now, this could mean switching from one topic to a completely different one. Or it could mean switching from one exercise on a topic to a related exercise. Timed breaks, together with planning it in advance, make it easy to ensure this happens. Which are you going to add into your practice first – setting an intention or using a timer? Let me know in the comments below.